In 1874 Captain John T. Lytle and several Cowboys left South Texas with 3,500 head of longhorn cattle. Five years later the route Lytle cut out of the prairie to Ft. Robinson, Nebraska, had become the most significant Cattle Trail in history - The Great Western Trail. The Great Western trail was less known than the Chisholm Trail, the Great Western Trail was longer in length and carried cattle for two years longer than the Chisholm. Established in 1878, Doan's Crossing was know on the trail as "the jumping off place." The last place to get mail and supplies before entering Indian Territory. Today the 1881 adobe building , still standing at Doan's is the oldest structure in Wilbarger County, Texas. In the 1930"s two markers were set at Doan's to commemorate the historical significance of the area. In 2003 a project was launched to mark the entire Great Western Trail with a cement post place every six miles the trail from the Rio Grande to Ogallala, Nebraska. Oklahoma Set the first post south of the city of Altus near the Red River, and challenged Texas to follow suit. Oklahoma donated the first post in Texas which was set in 2004 during the 121st Doan's May Day Picnic at the Doan's adobe. 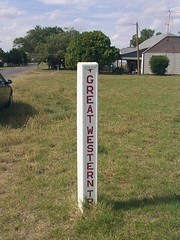 The posted marker is on the lawn of the Museum of the Western Prairie in Altus, Ok. Direction to Museum: From US 62/ Broadway , turn north at Hightower Street and continue nine blocks to the Museum. From US 183/Main Street, Turn east at D Street and continue four blocks to the museum. From Falcon Road, turn south at Memorial Drive and continue one block to the museum. Blue signs mark each turn. This marker is located in Friendship, Ok. East of Altus, Ok.